Bulgaria's economy and energy minister Traicho Traikov (front) and education minister Sergey Ignatov (back, yellow shirt) could be seen at Saturday's bicycle trip organized by Bulgarian students. Photo by BGNES. 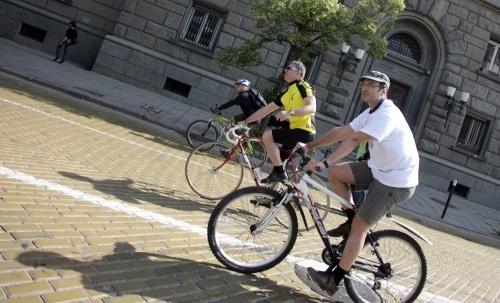 The first program for building a network of bike lanes in Sofia is ready, the mayor of Sofia, Yordanka Fandakova has announced. On Saturday Fandakova awarded students who participated in the traditional bicycle trip marking the end of the academic year. “It is expected the program to be finished in five years. The start of the program has been funded by the Sofia municipality and for the next stages we will try to find funding from the EU,” the mayor said. She added that the building of a 7-km bike lane in the Sofia district “Mladost” will begin in the fall. Over 300 people gathered Saturday morning for the event, which involved a 20-km ride to nearby town of Bankya. Students were joined by three members of the Bulgarian cabinet: Sergey Ignatov, Minister of Education, Traicho Traikov, Minister of Economy and Energy, and Tomislav Donchev, Minister for EU funds.